Perched on a hilltop overlooking the Tiber River valley in central Italy is the medieval town of Civita di Bagnoregio. Founded over 2500 years ago by the Etruscans this town was once a thriving village and it was the birthplace of Giovanni di Fidanza, most commonly known as Saint Bonaventure. Over the centuries earthquakes and ground decay has caused extensive damage resulting in landslides that have taken part of the town with it. This is why the comune is known as La città che muore (The Dying Town). The population has since dwindled and only a handful of residents live here year round. With the town slowly dying and nothing to lose they decided to charge people an entrance fee. It was a risk, but one that paid off because in recent years a boom in tourism has breathed some life into this dying town. According to the comune's website over 700 thousand tourists make the journey up the long footbridge, which is steep so keep that in mind if you want to visit the town, each year. 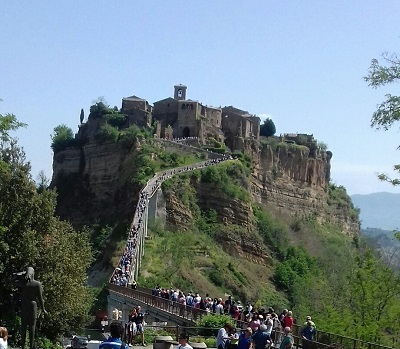 In fact Civita has become a place for lovers who make the long stroll up the footbridge to express their love for each other. At the top of the footbridge is the Porta Santa Maria, which is a doorway originally cut out by the Etruscans and later renovated to include a 12th century archway. Looking down on everyone that enters the town are two bas-reliefs of a lion holding a human head betweens its claws. Once you walkthrough the doorway it is as if you stepped back in time to the Middle Ages. Make your way to the piazza, which is the heartbeat of the city, and visit the church of San Donato and the Museo Geologico e delle Frane. The church was built on the site of an old Etruscan temple and then a Roman temple. The Museum charts the evolution of this hilltop town and how earthquakes and landslides have shaped this town and what they are trying to do to stabilize the area. Stroll through narrow cobblestone streets and admire the old stone facade of the buildings draped with vines and balconies adorned with flowers. Take a moment or two to look out at the picturesque views of the valley below. The true charm and beauty is that this hilltop village has been untouched by modern times.